The Gould & Goodrich L-Force duty belt looks like leather, but is actually made from a high-strength laminate material to increase durability and wear resistance. It features sleek nylon edge bindings for increased wear-resistance, as well as to round off any rough edges. The no-crush design increases its ability to support heavy loads, making it ideal for carrying a full law enforcement loadout, and its 2.25 inch width is compatible with the widest possible range of holsters and pouches. Its no-shine hardware won't give away your position by reflecting light, and its Cop-Lok buckle uses a three-point release to enhance strength and security. 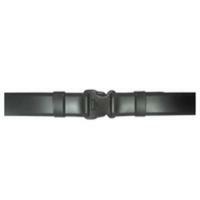 The belt is loop lined, allowing it to interlock with their X55 pants belt.